If enacted, Proposition 10 will repeal the Costa Hawkins Rental Housing Act, nothing more, nothing less. Costa-Hawkins was a bipartisan measure authored by Jim Costa (D-Fresno). A congressman now and a member of the Blue Dog Democrats, Costa has always been a shill for big agriculture, big oil, and the so-called real estate industry; and Phil Hawkins (R-Bellflower), a one-term 56th Assembly District representative who currently serves on the Board of Directors of the Central Basin Municipal Water District. The Costa Hawkins Rental Housing Act banned any vacancy control—regulated rents for units despite vacancy (think Berkeley.) It also entirely exempted single-family dwellings (including condo-converted units) from rent control. The most pernicious effect of the act was to absolutely prohibit local jurisdictions from enacting any future rent control for housing built after February 1, 1995. Think of it this way: In 1995 Congress prohibits states from enacting any automobile fuel emission controls or standards (for sake of the argument let’s not debate the constitutionality of this). The benefit to a few special interest groups is obvious—the oil companies and the auto manufacturers will get richer and richer. Meanwhile the pollution becomes more and more toxic. People begin to die. Shouldn’t our state have the ability to enact measures to control that pollution? Shouldn’t we, as a state, a more local government, be allowed the right to chart the course of our own future? As a state law, the Costa-Hawkins Act preempts any attempts by local governments to deal with the well-documented current housing crisis by controlling the price of rents in housing built after 1995. Proposition 10 repeals Costa-Hawkins, but does not mandate any rent control itself. It will be up to local governments to decide if they want rent control or not. Proposition 10 embodies the true spirit of California’s initiative process. The initiative process has been maligned in recent years, largely because special interest groups masquerade as populists (think Trump) and spend tons of money to confuse voters to support their various whims. Proposition 10 is an initiative written and supported by tenant groups who represent real people, tenants who are neither rich nor particularly powerful. Costa Hawkins was enacted by griftocrats showered in bribes…I mean contributions…from the so-called real estate industry that represents a small class of people who still deign to call themselves lords. Proposition 10 is exactly the type of law the creators of the initiative process envisioned—a law proposed by an underclass ignored and vilified by their supposed representatives. The various TV ads opposing Proposition 10 seem to cloak themselves in a kind of pro-tenant language: Prop 10 has no protections for renters, seniors, veterans, or the disabled. Correct. Prop 10 has no specific provisions to reduce rents. Correct. Prop 10 contains zero funding for affordable housing and contains no requirements that housing be built. Correct. All of these “arguments” essentially ask this question: Why aren’t there any peaches in this apple pie? Proposition 10 seeks to repeal an existing law that does not provide any tenant protections and prevents local governments from attempting to provide them. Costa-Hawkins prevents local governments from establishing rent control for buildings filled with senior, veterans and the disabled people built after 1995. Costa-Hawkins prevents local governments from establishing specific provisions to reduce rents. 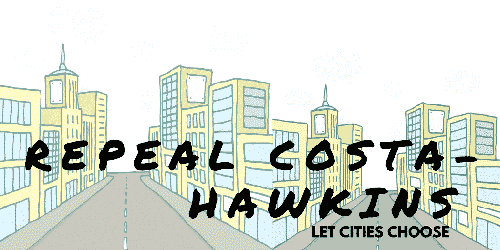 Costa-Hawkins prevents local governments from using rent control as a means to help to create affordable housing. Costa-Hawkins is only helps those “Captains of Greed” those landlords who can’t imagine a place where local control, real democracy, might seek to control rents. Once again, Proposition 10 only repeals Cost-Hawkins in order to return rent control decision making to local governments. Those who oppose repeal want to paint it as some kind of new rent control law. It is not. Those who oppose Proposition 10 would rather debate rent control on a statewide basis so that they can hide behind their slick, meaningless TV ads. They don’t want local governments to have right to chart the course of our own future. They abhor the idea that they may have to debate the issue locally, the idea that someone might know them and confront them personally, exposing their opposition for what it really is—unmitigated, inhumane, aristocratic greed. Vote Yes on Proposition 10!